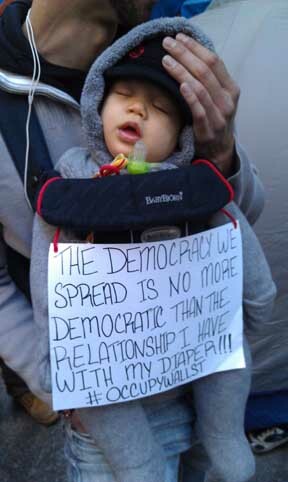 Oh yes, the blogger visited OWS this weekend. I came away impressed. First off, for a bunch of people packed into a space no larger than an indoor soccer field, they’ve had a pretty monstrous effect on the world. Second, for all the critics who have attacked their “organization” or lack thereof, they seem to be, if anything, overly organized: donate here, press requests here, drum circle over here. About that drum circle: laugh and stereotype all you want and you’re certainly within your rights. It is a freaking drum circle. But. The OWSters have been at it for six weeks now. They’re not watching TV. They’re not listening to the radio. They need something to keep them going. You have your iPod. They have drums. The biggest surprise, to me, was how entrenched the whole thing was. People are straight-up living there, and while we’re at it, kudos to the owners of the park for not booting them, which they could do (SPORTS REFERENCE AHEAD) faster than the Patriots could give up a 40-yard touchdown. It really is a little society down there, an alternately angry and happy, but uniformly smelly, one. Again: so what? 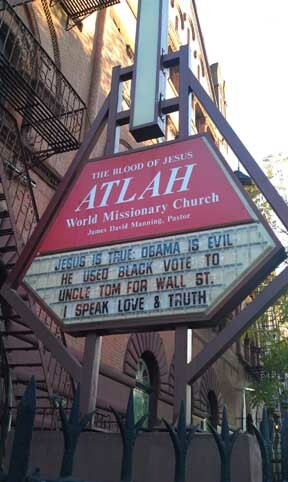 While OWS isn’t quick to identify itself with Democrats, they’d be wise to do it. They could make the Democratic party into a one-issue party a la the GOP w/r/t taxes, or Kenan Thompson on SNL: Fix it. We don’t care how. Fix this nonsense. Here are our votes. Work to actually fix things, and the votes will keep coming. That happened. And it’s happening all over the country. Obama’s taking it on the chin for something that is a lot bigger than just him. He wasn’t, the thinking goes, the one we were waiting for. But he never was supposed to be. Maybe it was just an inspired flourish of campaign rhetoric, but “we” were the ones we were waiting for. We were supposed to be the difference. Electing Obama wasn’t the cure-all, but a first step. We spent way too much time being proud of ourselves and not enough time giving him the help that he needs. The system is screwed up, but there’s one way to change it: occupy voting booths. It’s what the GOP does best. If people can live through the winter in an outdoor park in New York City—and I fully expect them to do just that—you and I can make our way to the polls to continue to vote for change. It’s not rocket science. Let’s not make it out to be. The babies would laugh at us behind their little masks. That would be kind of creepy, actually. What effect at all — let alone “monstrous” — have they had on the world? And as for “Fix It!” didn’t the Democrats have COMPLETE control of the Federal Government of the United States for two years? What about the broken promises of what the Stimulus would do to “Fix It”? What’s shocking to me is that, from your writing, I can tell you are an intelligent person. To think that anything other than that BOTH parties are completely up to their eyeballs in Wall Street corruption and crony capitalism is an absurdity. To be perfectly honest, when you look at Fan-Fred, and Democrat connections thereto, and Obama’s obvious connections to the Goldman money, it could be argued the Dems are even more in cahoots with Wall Street. A bunch of rancid hippies, assorted criminals and privileged white kids who incurred vast sums of educational debt to finance worthless degrees for which no job market exists except in their minds and the warped world that academia have had absolutely no effect on the world, except maybe to entirely piss off the people that live near where they’ve set up shop (illegally one might be inclined to add).